Whether you're looking for a hellish climb or just a long run along the Hudson, free from the crowds of NYC, this is the spot. The full trail is 22 miles out and back. At Palisades Interstate Park, you can run along the shore and see New York from across the Hudson either off-road on Shore Trail (marked with white blazes), or if you prefer a paved run, Henry Hudson Drive parallels it. As you go down Shore Trail, you’ll pass through a boulder field that’s known as the “Giant Stairs,” and face some serious ascents if you make it the whole way. For more trails, check out Long Trail (marked with aqua blazes), which runs up and down the cliffs a bit as it meanders along the Hudson. Want to run up a trail, instead of a terrifying road? The Dyckman Hill Trail is also right at the bottom of the basin, marked with yellow blazes and ready for some serious running action. It climbs 340 feet, but not an easy 340 feet. There are four more similar climbs as you make your way north on the run route, and the Forest View Trail one is the steepest. The trail runs 11 miles, so if you’re looking for a long run route, this is a fairly simple way to work in 22 miles of running in an out-and-back. With picnic areas peppering the shoreline of the Hudson, there are a few spots to stop and hit a restroom, and the State Line Lookout (right near the Giant Stairs, close to the end of the park) is a great place to stop, and has a refreshment stand if you need to refuel before turning around. At the bottom of the hill is the Englewood Cliffs boat basin and picnic area, and that’s where you can park, if you’re driving in from the city. It’s admittedly more of a driving destination, though you could also ride over the George Washington Bridge and ride in via the River Road entrance and lock your bike, if you’re looking for a brick workout with a hellish ending. It’s a great place if you’re a runner and your partner is a roadie, since he or she can ride from the park to Nyack while you do your long run. 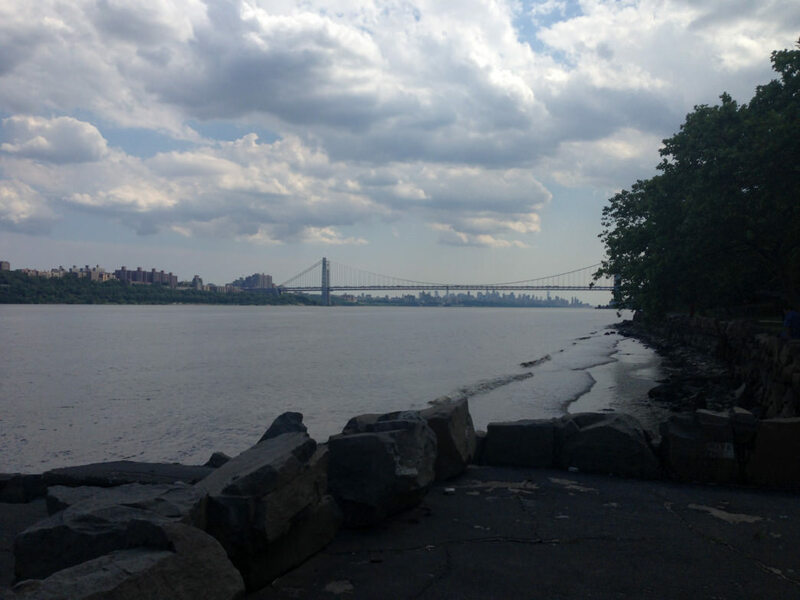 And if you’re looking for a long, long run, you can run from the city over the bridge and directly into the Palisades Interstate Park and onto the trails. It’ll be a long day, but a rewarding one! An easy place to start is the Englewood Boat Basin. Click here for directions.